Pictured above is the LRA-951-TFEED-3 kit on top of a 360 bearing turbo. The oil supply to your turbocharger is critical if you want to insure years or trouble free turbocharger life. The factory oil feed tube can leak over time and there is no repair for it. It's also common to see the oil feed line damaged from removing the turbocharger without loosening the banjo bolt on the balance cover and swinging the line up out of the way which when not doing so, causes the internal Teflon liner to kink and buckle restricting the oil flow to the turbo. This Turbo Oil Feed Lines is a complete replacement line to the original part. It utilizes the factory banjo bolt on the balance shaft cover. However from there out to the turbocharger is all new. Made from durable -4 size Stainless Steel braided rubber lined hose. We offer it with size fittings and connections on the turbo end. You need to figure out which size or style you need and here is the information to help you decide. Every 360 bearing turbocharger we have sold over the years whether it be our Sport or Super Series is tapped on the top of the turbo's center cartridge with a 1/8" NPT thread. 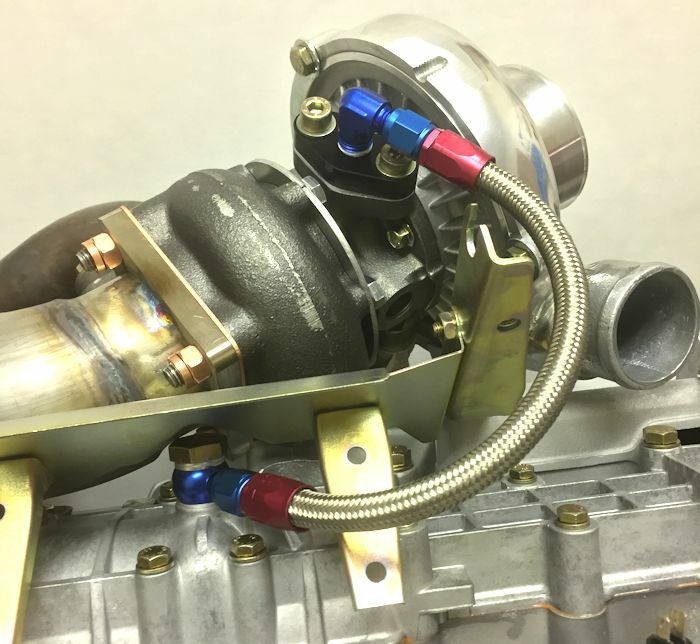 So if you want, you can eliminate the o-ring flange type connection and screw the supplied fitting with this line directly into the turbocharger. We will soon be offering a new flange in aluminum that utilizes the O-Ring seal and 1/4" NPT. This version is the same as LRA-951-TFEED-2 but with inlet flange included. This billet aluminum flange uses the stock o-ring for sealing the flange to the turbocharger. O-Ring included. Our Super Series Twin Ball Bearing Turbo's are "NOT" tapped 1/8" NPT on the top of the center section, but rather are a inverted flare connection. We produce our own special oil fitting which doubles as a oil restrictor which is required on the Twin BB Turbo's. This proper custom fitting comes with our turbo's when purchased new, or you can purchase it separately. This fitting uses a -4 JIC type connection which is that this line is for.